The last section is composed of five tapestries made by Carles Delclaux and one from José Royo. 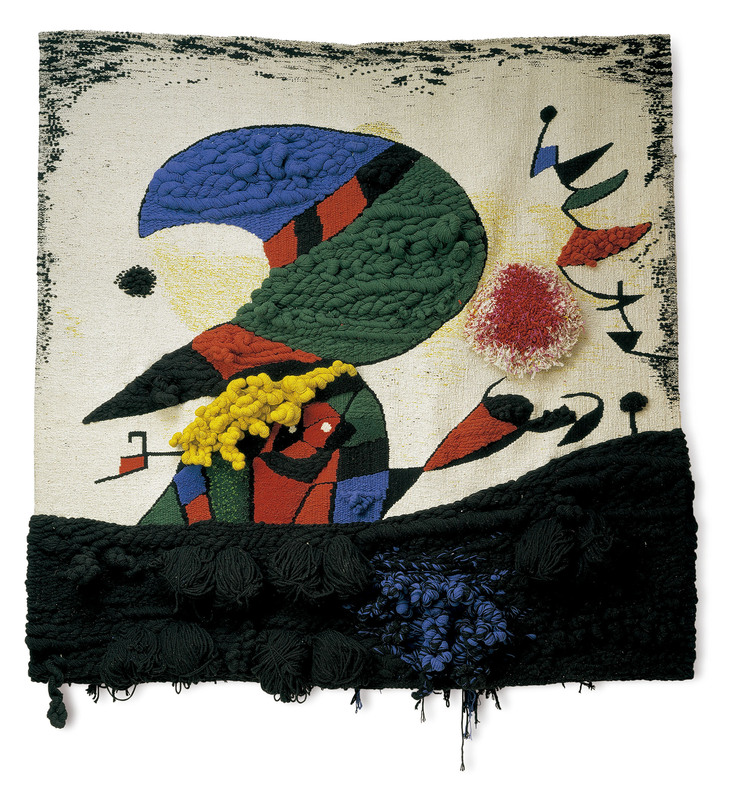 ´Tapis de la creació` (Creation tapestry) made by Carles Delclaux according to a sketch drawn by Joan Miró is a remarkable presence in the collection. You are touched by it both in a physical and an emotional ways. Delclaux carried out the project after the death of the Catalan artist as a tribute to mark the centenary of his birth. This tapestry is permanently exposed in the CDAN hall. It is a tapestry of 260×250 cm formed with more than 100 kg of moiré wool. The tapestry of Jose Royo is entitled ´Orla blava` (Blue border). It shows up his ability and skills for creating interweaves and sacks in which the textile handicraft, with a great wealth of textures, is integrated with cuts, rips, sewings, patches and other different components. In 2013 José Beulas donates four more Carles Delclaux´s tapestries. Three of them were inspired by some works of Beulas himself. They are ´Rostolls cremats` (1988) (Burnt stubbles), ´Campos quemados` (1989) (Burnt fields) and ´Sin título` (1988) (Untitled). All of them show the landscape of ´Los Monegros` (an arid land in Aragón) through the simplification and outline techniques that are used by the artist in his works. The fourth tapestry was inspired by a work of Manuel Miralles entitled ´Figura 69. Arpillera` (1969) (Shape 69. Sackcloth), for this creation the artist used the sackcloth as the main constituent of the composition. This work is included in the final stage of his career, which is characterized by the use of torn, resewn and perforated surfaces that have a limited black, white and red chromatic range, these are the distinctive colours of ´El Paso`group.